JAL collaborates with the Kumamto Prefecture government to create the 9th installment of the AIR SERIES: AIR KUMAMON. Image by Japan Airlines. Japan Airlines (JAL) has just announced the 9th installment of its popular AIR SERIES, a special Economy Class and Premium Economy inflight meal which JAL collaborate with well-know restaurants and food chains. But this time JAL will be collaborating with a local government of the Kumamoto Prefecture located in the center of Kyushu instead. So what's so special about this Taipien? The vermicelli is made from 100% mung bean which adds depth to its flavor. The soup is made from pork and chicken and with the help of Kourantei's secret recipe, JAL is able to achieve a beautiful balance of flavor. Also, a lot of the fresh ingredients used are from the Kumamoto Prefecture and represent its cuisine. 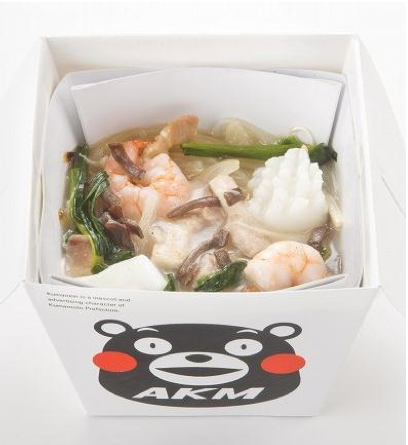 AIR KUMAMON is actually a Taipien dish. Image by Japan Airlines. And you know it wouldn't be an AIR SERIES dish if JAL doesn't allow you to have some fun and multiple ways to enjoy it right? :P The dish comes with a side of fried egg, chicken and lettuce. You can put these into the Taipien container and enjoy the fresh taste of the dish. Another way is to use the grilled rice ball into the soup and let it soak up all the flavor to create a JAL original taste. Of course, you can just eat all these separately as well. Other than the main dish, JAL has also collaborate with a famous sweet company, Kumamoto Kabo, in Kumamoto to create the dessert this time. 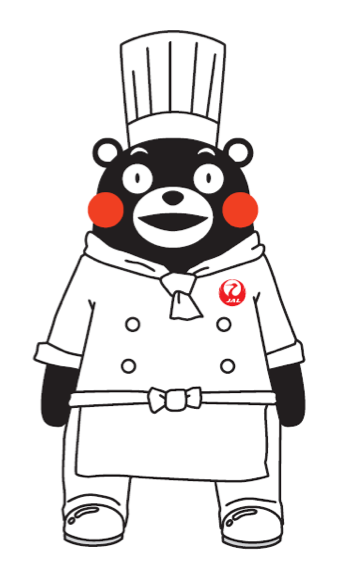 The KUMAMON custard cake is a very popular dessert according to the press release. JAL hasn't provided a picture of the actual cake, only the packaging is shown. But you can see the cake here. JAL has a special tray mat featuring KUMAMON for child meals. Image by Japan Airlines. Finally for the packaging, the designer of the KUMAMON character, Mr. Manabu Mizuno, has specially designed the meal box, tray mat and leaflet for JAL. Obviously they all feature the popular KUMAMON character from Kumamoto. If you are traveling with child, JAL also has a special tray mat for its child meals too. It features special KUMAMON that represents the destination, e.g. 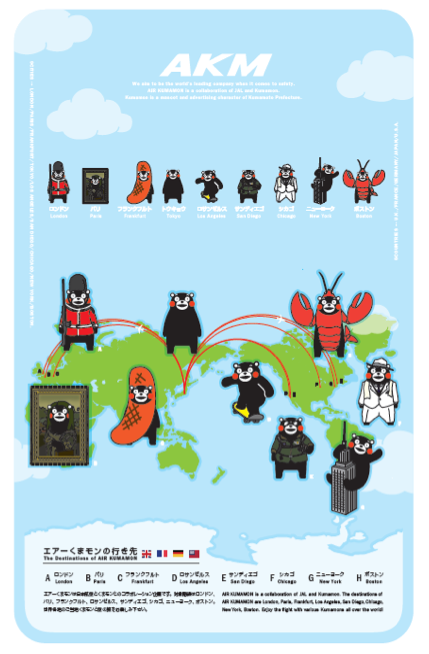 KUMAMON dressed as a lobster for Boston and sausage for Frankfurt. This special mat will be available in July and August during the popular summer travel periods. As usual, the AIR SERIES is served as the second meal before arrival on flights departing from Tokyo Narita (NRT) to select North America and European destinations. These includes New York JFK, Boston, Chicago, Los Angeles, San Diego, London, Paris, Frankfurt, and Helsinki. 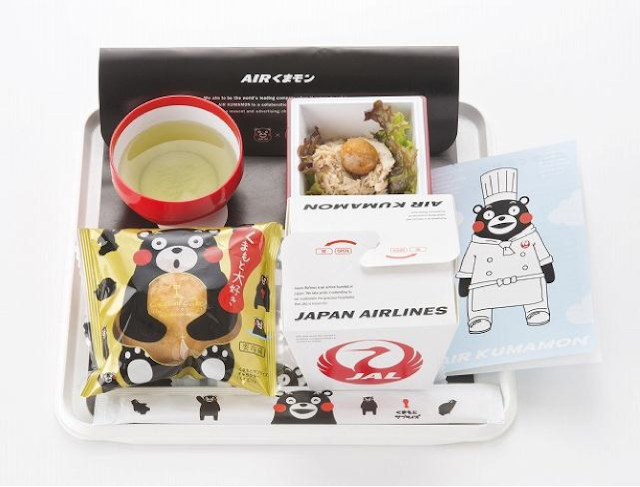 AIR KUMAMON will be available from June 1 till August 31 2013, with the exception of the Helsinki flight which JAL will start serving this when it finally launch the flight on July 1 2013. Unfortunately ever since JAL enhanced its catering in the premium classes with BEDD, it has stop serving the AIR SERIES dishes in Business Class and First Class. So only Premium Economy and Economy Class passengers will be able served.